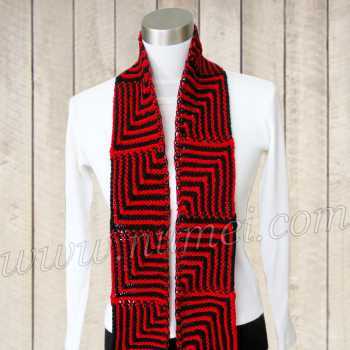 This knit skinny mitered scarf is so chic and beautiful, especially when made in black and red, or any two colors you prefer. Knitted Measurements: L 58" x H 4"
Note: Alternate between Color A and Color B every 2 rows, carrying unused yarn up along the edge/side of scarf. With Color A, cast on 35 sts. R1 (RS): K16, sl 2 st, K1, pass 2 slipped stitches over, K16. R2 & even rows (except R32): Knit. R3: Join Color B (do not cut Color A): K15, sl 2 st, K1, pass 2 slipped stitches over, K15. R5: With A, K14, sl 2 st, K1, pass 2 slipped stitches over, K14. R7: With B, K13, sl 2 st, K1, pass 2 slipped stitches over, K13. R9: With A, K12, sl 2 st, K1, pass 2 slipped stitches over, K12. R11: With B, K11, sl 2 st, K1, pass 2 slipped stitches over, K11. R13: With A, K10, sl 2 st, K1, pass 2 slipped stitches over, K10. R15: With B, K9, sl 2 st, K1, pass 2 slipped stitches over, K9. R17: With A, K8, sl 2 st, K1, pass 2 slipped stitches over, K8. R19: With B, K7, sl 2 st, K1, pass 2 slipped stitches over, K7. R21: With A, K6, sl 2 st, K1, pass 2 slipped stitches over, K6. R23: With B, K5, sl 2 st, K1, pass 2 slipped stitches over, K5. R25: With A, K4, sl 2 st, K1, pass 2 slipped stitches over, K4. R27: With B, K3, sl 2 st, K1, pass 2 slipped stitches over, K3. R29: With A, K2, sl 2 st, K1, pass 2 slipped stitches over, K2. R31: With B, K1, sl 2 st, K1, pass 2 slipped stitches over, K1. R32: With B, Sl 2 st, K1, pass 2 slipped stitches over. R2: CO 18 sts at beginning of row, K16 st of stitches just made, sl 2 st, K1, pass 2 slipped stitches over, K16. Repeat R3-R32 of Square 1, alternating between Color A and Color B every 2 rows, carrying unused yarn up along the edge/side of scarf. Repeat Square 2 until you have a total of 12 squares. Alternate the color you use to begin each square, ie use Color B to start second square, use Color A to start 3rd square, Color B to start 4th square and so on.